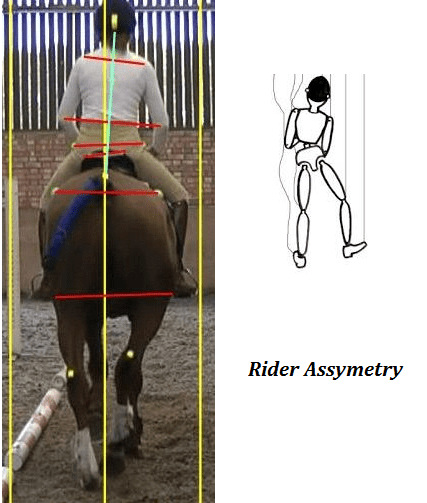 How much consideration have you given to your own rider asymmetry? Consider this … you are having a lesson. Your issue is that your outside shoulder drops and turns to the outside on the right rein. Your coach explains what is happening and demonstrates how your body position is affecting your horse. You are very clear in your mind what is going wrong and what you need to do to rectify it. It’s your turn to show what you have learnt. You put yourself into position and off you go onto the right rein. You start off with the shoulders in alignment with the horse but before you have turned half a circle the shoulder has dropped and is tuned in the wrong way, exactly as you had before the instruction. You do it wrong. Are you not trying? Are you a fool? Of course not, you are perfectly normal and have reacted exactly just as 85% of riders do. Why? Because of muscle memory. Most of us have come across this term at some point in our training, but it is not a memory stored in the muscles, of course, but memories stored in your brain. If you’re practicing your riding skills over and over again, the idea is that you’ll continue to improve, after all ‘practice makes perfect’ right? The more you do something, you build up what is known as ‘procedural memory’ and your brain can fairly quickly learn to instruct your muscles to carry it out its instructions. Great, all we have to do is regularly repeat. You can become very good at something through repetition, but in exactly the same way it can make you weak at that same thing. Your muscle memory can actually play against you if you’ve constantly been practicing something the wrong way. Muscle memory doesn’t have the ability to judge whether you are riding well or not so if you practice sitting crooked (unknowingly) for hours on end you’re going to be really good at making those same mistakes over and over again. When you repeat faults again and again, you build a muscle memory with those mistakes built in. That makes them really hard to overcome. This is why some rider faults plague us in the same way that the very irritating matter of rolled up sleeves that fall down would. Yes, you are training, you are getting hot so, up go the sleeves. You feel the sleeves creeping down your arms but it’s ok they’re only just past the elbow. Before you know it they’re down and you are getting hotter but you don’t know why. Then you realise you’re sleeves are down and you have to push them back up. This is exactly the same as your muscle memory. It happens in your subconscious, without your knowledge and before you know it your hip has collapsed and you are sitting crooked. It takes something in your conscious state to have you make the adjustment. This explained to me why, after many years of riding, I had not progressed. I was not using my hands, legs and body the way I thought that I was using them. Because of this, I practiced the training techniques over and over but made no improvement. The key to building good muscle memories is to focus on the quality of the quantity and here is that old saying again, ‘practice makes perfect’, well, no it doesn’t actually, only ‘perfect’ practice makes perfect. You may have heard, probably from Malcolm Gladwell’s book Outliers, that 10,000 hours is the magic number to make you an expert. It’s likely that this is the case when you practice well, but if you spend those 10,000 hours practising ineffectively you will build procedural memory in your muscles over and over again and guess what, you get really good at repeating your mistakes. Most of us don’t want to be expert anyway, competent will do. So it is not going to take 10,000 hours for you to eradicate those irritating rider faults that creep in and out of your riding. Once you have identified your fault, be it collapsing, head tilting, knee gripping, elbow flying, hand opening, heel lifting, whatever it may be, when you practice, take it slowly at first. Don’t identify several faults and rush to change everything. Break the faults into parts and concentrate on learning one part really well. Prioritise the effects that your rider errors are having on your training and practice the most important one until you’ve got it down, then add other elements until eventually you will have mastered the faults. Try, practicing for about 5 minutes whilst just sitting on the horse if this is possible. Have a friend video you riding your horse and study the video closely, often actually seeing what you are doing wrong is immensely helpful. This is where mirrors are a real bonus. If you still aren’t doing it right, sit on your horse, concentrate and go through the motions correctly. Do this over and over until you get the feel of it. Then pick up the reins and try it for real. Dressage is a thinking sport, riding is all about strategy and although the general consensus is that muscle memory is best cultivated when the same activities are practiced over and over again, with any corrections of form that are needed, it appears that despite this practice, attitude can interfere with muscle memory. Nerves can lead to clenched or tight muscles that can’t quite perform as they would if you weren’t thinking about it and self doubt about your abilities to perform may also affect muscle memory. The ‘lack of confidence’ factor can over-ride any positive strides achieved in rectifying muscle memory faults. The great master Nuno Oliveira said, ‘I don’t want riders who work physically hard. Work by thinking.’ – 1998. When you consider that even the training of your muscles is actually down to training your brain to work your muscles and the way you approach your riding can overcome even this very strong instinct, you can begin to appreciate this approach to your training. what a great piece of advise! I also try to keep focused on one problem at a time – the only way it works for me!